It’s Back to School season, and for some, that means back to bashing the federal school meal program. 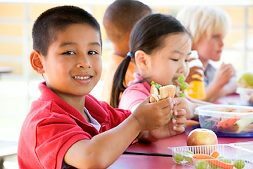 On August 27th, a widely disseminated AP article misleadingly implied that new healthier lunches were causing a mad rush by school districts to withdraw from the federally funded National School Lunch Program (NSLP). Nothing could be further from the truth, but apparently the ‘Kids hate healthy food’ story line is now the default for lazy media, just as the ‘School meals are crap’ story line was 5 years ago. Recent rule changes to school meal programs require more fruit, vegetables and whole grains, but provide only 6 cents extra in federal money to pay for these more expensive upgrades. As school cafeterias move away from longtime kid favorites like corn dogs and fried potatoes, some have seen revenues decrease, especially in wealthier communities. The vast majority of schools have more than a handful of low income students, and therefore must rely on the NSLP funding for cafeterias; this means following government rules on healthy food. However, schools that serve almost entirely affluent populations can absorb the cost of providing free meals to their few low income students even without the government payment. Withdrawing from the NSLP, and its funding, means these schools can ignore federal rules mandating healthier fare, and are free to sell their students anything the students want to buy, including junk food. The AP story stated “The School Nutrition Association found that 1 percent of 521 district nutrition directors surveyed over the summer planned to drop out of the [NSLP] in the 2013-14 school year and about 3 percent were considering the move.” If 1% of 521 nutrition directors surveyed did in fact say their districts were dropping out of the NSLP, that would equal a grand total of only five (5) school districts out of 521 leaving the program. But that wasn’t even the question asked on the survey. The School Nutrition Association, horrified at how their survey was being misrepresented in the media, posted a clarification on their website the day after the AP article appeared, explaining that the survey had not asked student nutrition directors if they planned to remove their entire school district from the NSLP, but rather if they expected to drop any individual schools within their district from the NSLP. Some school districts are comprised of some higher income, and other lower income, schools. In other words, the 1% figure was not, as AP reported, the number of “districts” dropping out of the program, but rather the number of directors who indicated they would be dropping “a school” from the program. There have always been schools that moved into or out of the NSLP as their number of low income students rose or fell. As many school districts are comprised of dozens, even hundreds, of individual schools, confounding a single school with an entire district is kind of a big mistake for AP to make in reporting this story. But then, five nutrition directors saying they would drop one school from the program wouldn’t really be a story at all, would it? The article cited three districts that planned to drop the federal meal program, but without mentioning that all of them are very small. For example, Voorheesville School District in NY was mentioned, but not the fact that the district has just 3 schools serving a total of about 1300 students. The Catlin Community School District, in Illinois, also mentioned in the article, has just two schools, serving about 500 students total. The only other school district mentioned, Burnt Hills-Ballston Lake in upstate NY, has a total of 5 schools and a student population of about 3200. With over 100,000 schools and more than 31 million students participating in the National School Lunch Program in 2012-13, how does the loss of these 10 schools and their 5,000 total students merit even a paragraph in a small town weekly, let alone an AP story? But the AP article, which triggered several other copycat articles, wasn’t the only one to get the story wrong. A CBS news report claimed that a school board official in Kentucky said that “students thought the healthy fare ‘tastes like vomit’ “, which would indeed have been an unflattering assessment of the new improved school lunch – if only it were true. In fact, the original quote from Harlan County school board member Myra Mosley, as reported in the Harlan Daily, referred only to the lower fat milk now being served in school cafeterias, not to the entire lunch. Again, kind of a big error on the part of a national news organization. The CBS report also singled out the Laguna Beach school district in Southern California for special mention. “The Laguna Beach Unified School District, in Southern California, is the latest district to rebel against the federal healthy lunch program — a cornerstone of first lady Michelle Obama’s campaign against childhood obesity. The school district announced Tuesday night that it will revise its lunch menus,” claimed CBS. Later in the report, the Laguna Beach student nutrition director, Debra Appel, is quoted as saying “It’s not the chicken nuggets, it’s not the popcorn chicken. It’s not the corn dogs and stuff that the kids really liked”, as if she were objecting to the changes that have brought healthier offerings to her cafeterias. Again, nothing could be further from the truth. After seeing the CBS news report, I contacted Debra Appel. She told me that her school district has no intention of dropping any schools from the federal meal program, and that contrary to what the CBS report trumpeted in its opening, Laguna Beach is not “rebelling” against school meal regulations, nor does it object to or intend to back away from the new healthier meal regulations. Like the children’s game commonly called Telephone, or Whispering Down the Lane, the more these inaccurate news articles get repeated, the more the mistakes are compounded. Um, I wonder what “bureaucracy” he is referring to, and why he feels that regulations, passed by Congress, and designed to maximize the amount of healthy food, and minimize the amount of junk food, served to children, should be replaced by a more “sane” policy? The Healthy Hunger Free Kids Act of 2010 established the new regulations requiring more fruit, vegetables and whole grains in school meals, and less sodium and empty calories. This was an important step in addressing childhood obesity that puts kids at risk for developing heart disease, type 2 diabetes, some types of cancer, and other problems that mean the current generation of children face the possibility of a shorter lifespan than their parents. For years, the media was filled with coverage of crappy school lunches comprised of breaded meat, french fries, and cake; unhealthy eating at school, we were told, was driving the childhood obesity epidemic. When the legislation setting higher standards for school meals came before the Senate in 2010, it was considered such a no-brainer that it passed on a unanimous voice vote. Just 3 years ago, CBS News was blaming the prevalence of fast food in the American diet, even in school lunchrooms, for increasing obesity in this country. Thank goodness schools are now required to offer healthier food in their meal programs, and thank goodness for school nutrition directors like Debra Appel, and so many others around the country, who are managing to tweak their cafeteria menus so that they both appeal to student palates and also meet current school meal regulations. That’s good news, and that’s the story the media should be reporting. Dana Woldow has been a school food advocate since 2002 and shares what she has learned at PEACHSF.org. Follow her on Twitter @nestwife.